Precision medicine is rapidly evolving in the gastrointestinal (GI) malignancies space, with biomarker testing opening up options for the treatment of these diseases. 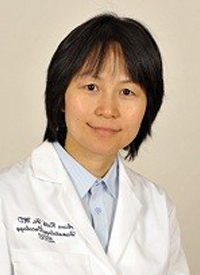 This puts a greater importance on molecular testing for patients, says Aiwu Ruth He, MD, PhD. The FoundationOne CDx (F1CDx) cancer biomarker assay was approved by the FDA in November 2017 concurrently with a decision from the Centers for Medicare and Medicaid Services to provide insurance coverage for the next-generation sequencing–based in vitro diagnostic test. This test detects 324 different genes that can identify actionable mutations, including microsatellite instability (MSI) and tumor mutational burden, across 5 tumor types. Additionally, the Caris Molecular Intelligence tumor profiling service includes MSI testing. These tests can be beneficial for patients with unresectable or metastatic GI tumors who are deemed to have MSI-high (MSI-H) or mismatch repair deficient (dMMR) solid tumors, because they can receive pembrolizumab (Keytruda) and potentially respond to that agent. Other molecular markers and targets can be identified through testing and can guide treatment, as well. He says that precision medicine will increasingly mature over the next few years, and it will allow clinicians to better identify biomarkers and targets more effectively than present-day techniques. In an interview during the 2018 OncLive® State of the Science Summit™ on Gastrointestinal Cancers, He, an associate professor of medicine at the Georgetown-Lombardi Comprehensive Cancer Center, discussed the future of precision medicine in GI cancers. OncLive: Please provide an overview of the panel that you moderated at the State of the Science Summit. He: We had 4 excellent faculty who talked about the updates to pancreatic and hepatobiliary cancer treatment, treatment of neuroendocrine tumors (NETs) of the GI tract, and precision medicine. Molecular profiling has been identified as a very important tool in pancreatic and biliary cancer. Some of the faculty spoke about liquid biopsies and the importance of taking a biopsy of a patient’s tumor early, as there is increasing evidence showing that specific targeted genetic alterations can lead to treatment that may change a patient's outcomes. Dr Allyson Ocean talked about the genetic predisposition of pancreatic cancer, and how that impacts the family of these patients. She also discussed the importance of supportive care for patients with pancreatic cancer. For these patients, although a lot of effort has been put into research to develop new therapeutics and biomarkers, there are still limited treatment options and poor outcomes. Dr Michael Morse talked about the changes in the treatment landscape of liver cancer with the expansion of treatment options for systemic therapy, and the emerging role of immunotherapy. He also discussed the very limited treatment options for bile duct cancer, and emphasized the importance of molecular profiling the tumor to identify targetable genetic changes. There are ongoing clinical trials trying to target those genetic changes that do not occur very often, but now we have therapeutic agents that target those changes.